How much should a toddler drink? Toddlers should be offered approx. 100 – 150 ml to drink out of a cup at each meal. The total daily amount they should be drinking is about 1 l. Your child’s thirst can of course vary: when your child is very active or when it is very warm outside, your child will need more. Water is the most suitable (drinking water from the tab or mineral water like HiPP Baby Water) and unsweetened herbal teas or fruit teas to quench children’s thirst. 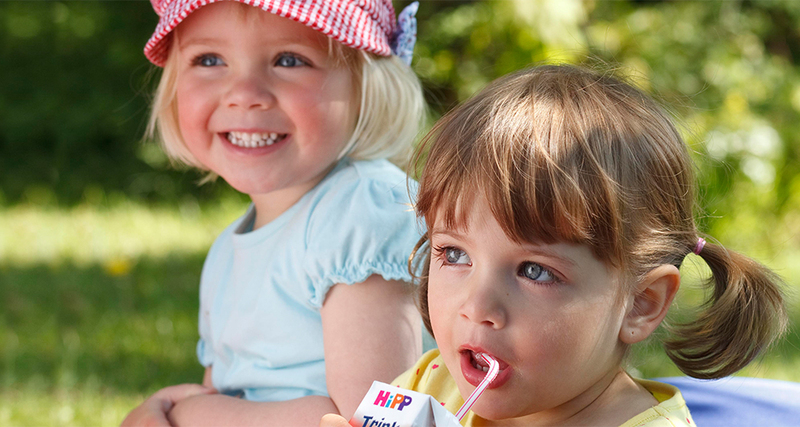 From time to time, you may offer your child diluted fruit juices in a ratio 1 part juice and 2 parts water or tea. You can mix diluted juiced yourself by using 100% fruit juices and tab or mineral water. Is my child now old enough to have fizzy drinks? Most times, fizzy drinks and soda pops contain a high amount of sugar and supply a lot of energy, whereas their content of fruit that delivers vitamins and minerals is rather small or non-existent. Therefore, they are, as well as beverages containing caffeine, not suitable as thirst quenchers.